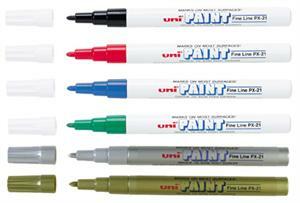 When you need oil-based paint in a handy marker, Uni paint markers, the most popular paint marker on the market, are perfect for you. 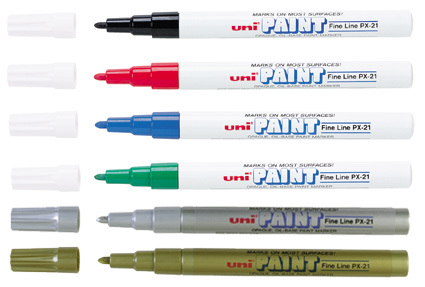 These fine point markers can mark on virtually every surface and are extensively used by manufacturers, construction professionals, and hobbyists. Furthermore, they are great for marking sheet metal, auto parts, glass, pipes, wood, concrete, leather, stone, and tile. You can purchase these markers in 12 bold, weather resistant, and fade proof colors. The pointed tip is approximately 1/16" in diameter. Choose an individual marker or 6 and 12 multicolor sets.